Chile on an Indian trail. 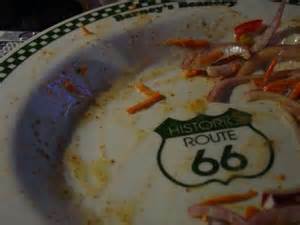 Route 66 Diner. Juke Joint/Pool Hall. ’50s Beatnik hangout. A drag ‘n’ eat pad. A place where movie people go to let their hair down. Home base of screenwriters, authors and Pop Artists. Watering hole for rock ‘n’ roll legends, greater Los Angeles area residents and visitors from exotic locales reading tour guides about Hollywood. Barney’s Beanery is all of these rolled into one, an esoteric and inclusionary delight in an increasingly exclusive tinsel town. A timeless, last bastion of the freewheelin’ American West, and constant spirit of the open frontier that remains, historically, L.A.. This, perhaps was a reflection of a typical conversation with the owner. The restaurant’s down to earth atmosphere is a direct reflection of his personality. In 1945, Hollywood Nightlife magazine noted the way in which Barney treated his customers, as if they were buddies from the service. “Barney Anthony is a name known to most writers who at one time or another have been broke in this town. Barney has always made sure that they have had food and just a little cash to tide them over.” Another account from the Los Angeles Herald-Examiner shows the tough guy as a man of compassion and understanding; “He listens to their problems, gives good advice when asked, but it is his manner more than his words that carries the conviction.” Barney was a realist, as his note at the bottom of the clipping, which he saved, reads “Hell, nobody is this wonderful!” Indeed, some of the license plates had been pulled for collateral on a dinner bill. As the mid-century expansion of the fifties took place, the changes surrounding Barney’s Beanery were reflected within its walls. Still a movieland hangout, Barney took a step into futurism with a special rig for his regular clientele. “It is not generally known, but the old-fashioned coach lamp hanging in front of Barney’s Beanery has a gadget inside it installed by a radionics inventor from U.S.C.” reported Bill Kennedy in his Mr. L.A. column in a ‘55 issue of the Herald-Examiner. “Operating like a radio-controlled garage door, the coach lamp is able to pick up radio beam signals from as far away as 25 miles. By prearranged signals, messages flashed from a unit installed on a patron’s car can inform Barney just how many will be in the party, what they want to order, and how soon they’ll arrive. Among the celebrities who have installed a Beanery Beam are Lou Costello, Wayne Morris, Donald O’Connor, George Gobel, Otto Kreuger and Gloria Jean.” The times were really beginning to change. It was also in the ’50s that Barney added the extra rooms. Changes also took place in the arts. The Big Bands of the original swing era were being shaved down to small bebop combos. Television had a symbolic relationship on both radio and films, and mainstream Hollywood was hit double by the realism that began to emerge from the foreign cinema. Black jazz musicians were no longer segregated by the musicians union, and Sunset Strip nightclubs such as the Renaissance, the Crescendo, the Purple Onion and Pandora’s Box began to resemble the beat scene that had originally thrived in Venice and Manhattan Beach. With James Dean looming nearby at the coffeehouse known as Chez Paulette, the loose feel around Barney’s Beanery weathered the transitional period without a hitch, almost. Life was more aware in their 5-page spread on the piece. “Kienholz began thinking about making his own Beanery around 1958, but he didn’t do anything about it until August 28, 1964. On that day, on the newsstand outside Barney’s door, he caught sight of a headline: ‘Children Kill Children in Vietnam Riots.’ “It was that headline…” said Kienholz – the harsh contrast between the ‘real time’ symbolized by the newspaper and the ‘surrealist time’ of the escapists inside the bar – that got him going. 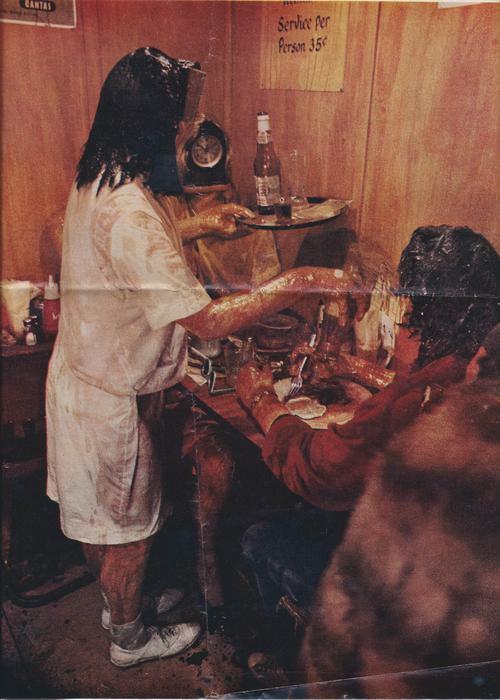 Their heads are clocks whose hands are stopped at 10 past 10 – to suggest eyebrows, says Kienholz, but also to indicate that the denizens of the bar are all killing time.” In the work, Barney is the only person who has his own head on his shoulders. By 1965, the film industry had been temporarily eclipsed by the counterculture in Hollywood, and the nearby Sunset Strip was again the center of the action. The beat jazz scene of the ’50s had evolved on the Strip, and had absorbed the folk and rock ‘n’ roll music popular with the coming generation. The Byrds changed the Strip at its ground zero, Ciro’s, nearby at the corner of La Cienga and Sunset. Via the music of the Byrds, Bob Dylan’s protest songs and political message began to spread throughout popular music. For two and a half years, Hollywood, not San Francisco, was the motivating force behind the social revolution, with bands like Love and the Seeds defining flower power, an L.A. invention. Frank Zappa & the Mothers debuted at a club called the Action on Santa Monica Boulevard itself. Several blocks east at Crescent Heights, P.J.s featured garage punk godz the Standells and the Bobby Fuller Four as house bands. To the west on Santa Monica, the Troubadour (along with the Ash Grove on Melrose) represented the hotbeds of the local folk movement. From this creative environment, the Doors emerged with a logical extension of beat poetry and rock ‘n’ roll dynamics. 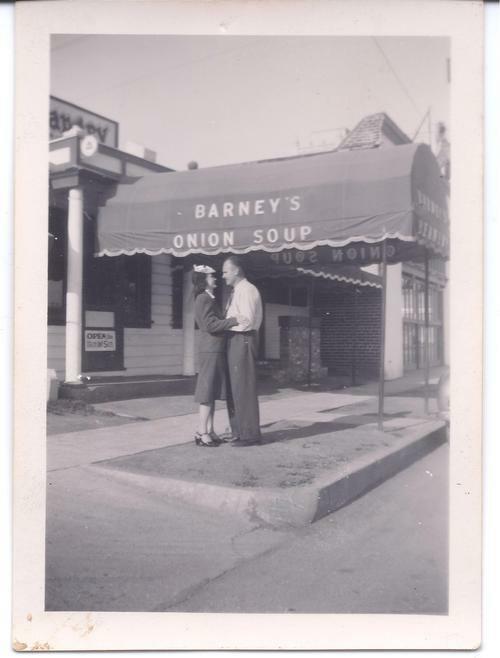 Barney’s Beanery was a natural magnet for people involved with the new scene. Thespians from Marlon Brando straight through to Jack Nicholson had gravitated to the respective art, jazz and rock ‘n’ roll scenes, and frequented Barney’s as part of these movements. In Datebook, Tom Carvey of the Everpresent Fullness featured it in his Hip Teen Guide to L.A.: “At about 3 a.m., Barney’s starts to get crowded. The people here are older; more the college and intellectual types, and many interesting discussions take place on a high level wave. They serve good apple pie and it’s a very friendly place.” In November of 1966, police harassment of kids with Beatlesque hair and mod clothing resulted in a riot at Pandora’s Box (Sunset & Crescent Heights.) The militaristic sweep of teen hangouts, for the most part, had extinguished L.A.’s momentum as the center of the counterculture revolution. The Ferus Gallery closed at around the same time, and the magnifying glass of the media began to focus their attention to the underground scene in San Francisco. Barney’s Beanery became one of several bomb shelters in the local area for what was now becoming nationally hyped as the hippie movement. 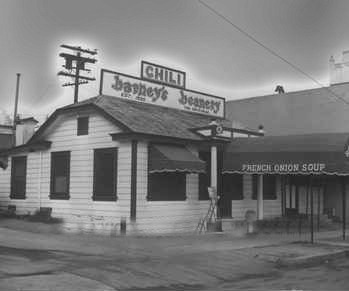 Two of the main figureheads from Los Angeles and San Francisco, Jim Morrison of the Doors and Janis Joplin of Big Brother & the Holding Company, respectively, became the celebrities most associated with consistent patronage of Barney’s Beanery. Janis had a favorite booth; #34. Morrison had a penchant for teasing Joplin, and one incident commonly recalled is a catfight between the two, with the bawdy Joplin successfully belting the playfully demonic Morrison. 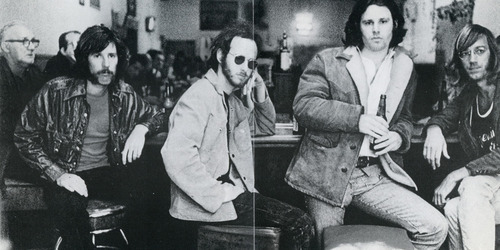 It’s no secret why the Doors frequented Barney’s Beanery. Their offices and their label (Elektra Records) were both nearby. 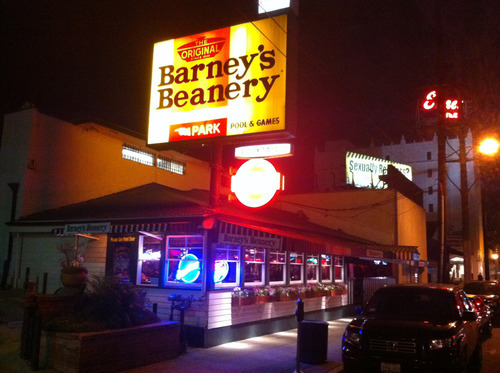 With the fires of protest all around it, the time had come for Barney’s Beanery to experience it’s own trial by populous. On Saturday, February 7th, 1970, the Gay Liberation Front and other concerned organizations began picketing in front of Barney’s Beanery to have the “FAGOTS – STAY OUT” sign removed from the bar. In 1964, a Life magazine story on the emergence of the gay culture in public had featured a steadfast Barney posing in front of his sign. By the end of the decade, Erwin Held had acquired the restaurant from the estate of Barney C. Anthony, who had passed away on November 25th, 1968. Erwin contested that he wanted to keep the place close to original, as he had obtained it. The argument of oppression and discrimination was uncontestable, however, and the offending sign was removed in the mid-seventies and relocated to its current place in storage. Firmly ensconced in the comfort zone with a bearded, longhaired clientele, employees at Barney’s Beanery were shocked and saddened to hear that after a typical night of partying at the bar, their friend, Janis Joplin, was found dead at the nearby Landmark Hotel, where she had overdosed on heroin. A year later, Jim Morrison also bid adieu to Los Angeles, and the planet, passing away in Paris. The roadhouse feel of Barney’s Beanery began to take on the mantle of its counterculture heritage. With the values of a new decade, Hollywood enjoyed a renaissance in film. Easy Rider, and other realist films such as The Last Picture Show, Carnal Knowledge and Chinatown were driven by the kind of anti-hero that we associate with the young crowd that embraced the restaurant. Another memorable event took place in 1970 down the street at the Troubadour, when British Blues Boom rockers Led Zeppelin sat in with British Folk group Fairport Convention. When the jam session was over, the entire entourage made it over to Barney’s Beanery for another wild night. The bawdy atmosphere of this juke joint owes a great debt to the wait staff, and one member happens to be a cult artist in her own right. Former lead singer of pop group Nikki & the Corvettes have now evolved into author Nikki while holding down a job at Barney’s Beanery. 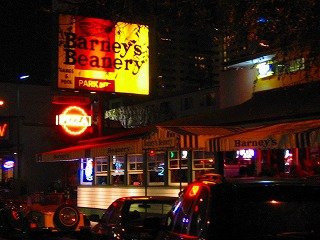 During the ’90s, films such as The Doors and Out of Bounds featured Barney’s Beanery as a location. As the altrock.com and independent film generation emerged, scriptwriters such as Quentin Tarintino would hole up in one of the multi-colored padded booths, ordering chow from the extensive, newspaper-like menu, to write such epics as Pulp Fiction. Controversy can still surround the place, as when Drew Carey formed a public protest in 1999 against California’s smoking ban by inviting press and television cameras to the bar at Barney’s Beanery, to watch him and his pals light up a few cigarettes. As the new millennium dawned, the restaurant was purchased by David Houston and Avi Fattal, who will cultivate the natural atmosphere as it has always been from the earliest days of Barney C. Anthony. Good food, good fun, and the realization, even in Hollywood, that we are all, essentially, human beings worthy of respect.